From tomorrow, October 12, until October 31 we are gonna give away special Halloween packs for DarkOrbit. These packs are only valid if you are a new user if you registered through our links. Each pack contains: 10 Bootykey green, 5000 UCB-100, 50 extra energy and 1 month premium. Step 3. 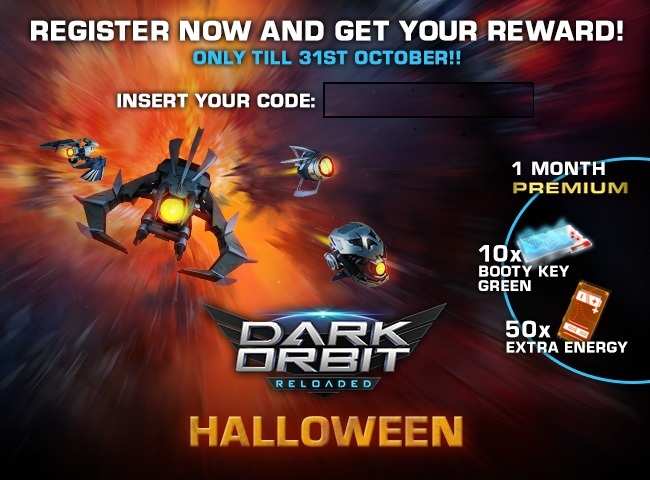 Visit DarkOrbit and create an account. If you already have one, redeem the code. This entry was posted on Tuesday, October 11th, 2016 at 5:28 pm and is filed under MMO News. You can follow any responses to this entry through the RSS 2.0 feed. Puedes dejar una respuesta, o un trackback desde tu sitio web.